Welcome to week four of the Saturday Spark! Hopefully you will take the challenge and let everyone know how it is going in the comments section below. So, how did everyone do with last week’s challenge – Starting the Day Off Right? Did you take some time for the two of you in the morning? Just a “Good morning,” or “I love you” with a meaningful kiss can help set you up for a great day! As I mentioned, my husband and I do this every morning, and this week was no exception. Going for an evening walk with your spouse is a great way to get in some exercise and have time to talk. My husband and I don’t do this as often as I would like to, but when we do, we always have such great discussions. Sometimes on the weekend, we will grab the dog and wander the neighborhood. Since we just moved into our house a couple of months ago, we have fun exploring and seeing what we find. You don’t have time? Do you have time to watch TV? If so, then you have 20 minutes to go for a walk. Get up off the couch and out of the house. Enough said. There isn’t anywhere to walk in your neighborhood? Some neighborhoods don’t have sidewalks or have streets that are too busy. That doesn’t mean that you can’t go for a walk…it just may take some driving! Drive to a nearby neighborhood with less traffic and more sidewalks. Go to a park or into town for window shopping. It is too cold, or it is raining? Head to my favorite place to walk…the mall! So, your challenge this week is to go for a few walks with your spouse. Grab the dog, and even the kids – head out into your neighborhood, or drive to a local park and walk on a trail. Hold hands. You will get some great fresh air, exercise, and quality time! Let us know how it goes – write a comment below or blog about your week and include your link in your comment (feel free to use the button above on your blog with a link back to this post). Do you have an idea for a Saturday Spark Challenge? Let me know. Sneak peak at next week’s Saturday Spark… Don’t tear down. 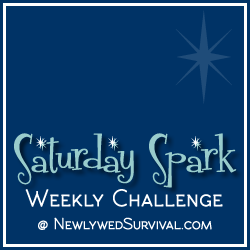 Love this "@NewlywedSurvive: Saturday Spark Weekly Challenge – Week 4 – Go for Walks Together http://t.co/GkqaUYxf #marriage"
Agreed. Just walking together is a beautiful thing! Great idea, and a wonderful way to connect!